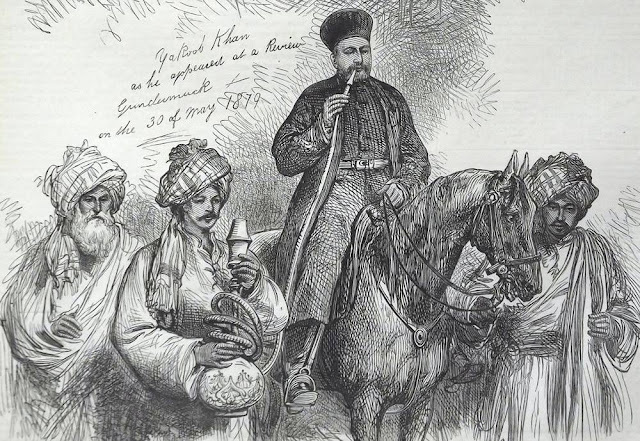 In addition to the “cameez,” or shirt, the Afghauns wear during their severe winters a leathern spencer called “neemcha” (half-jacket) , which is tanned, and tastefully embroidered in silk patterns, and is worn with the wool inside, as is the “posteen” (of which a drawing is given in the dress of Gool Mahommed) , and, in place of the full trousers, thick black cloth ones are substituted, fastened by a rope round the waist, and bound with the same material from the ancle to the knee. Their arms and remainder of their costume have been elsewhere described: but, in addition to the rosary, I must not forget to mention that they wear amulets, relics, and little bags full of texts and prayers tacked inside their dress, or hung about their persons, which they imaging are powerful enough to preserve them from danger or death. They are also inspired with confidence and daring by their Moollahs, who consecrate their rifles and cannon-balls used against infidels, from which they aver none but the faithful can escape. We met with considerable resistance from these “children of the cloud mountains” at this “Boorj” (watch-tower) in the engraving, between the valleys of Mydaun and Urghundeh, on our advance from Candahar to Caubul. We found them posted in a chain of mountains to intercept our passage, with an army of twelve thousand horse and foot, commanded by Shumsoodeen (the Scimitar of the Faith), and Sooltaun Jaun (Emperor of life), the two nephews of Dost Mahommed. Shumsoodeen, it may be remembered, was the chief who besieged and retook Ghuznee, nominating himself governor, after making the British officers captives, massacreing a portion of the garrison, and enslaving the remainder. We defeated them near Urghundeh, as signally as we had already done on two former occasions; first, in the battle of Goaine, south-west of Ghuznee, when Shumsoodeen advanced against our camp with twelve thousand men, supported by two nine-pounders which he had brought from Ghuznee. We entirely routed him, capturing his guns, and destroying his standing camp, ammunition, and baggage. His cannon was excellently served, and did great excecution. The capture of one piece was attributed solely to the gallant efforts of Capt. Christie and Chamberlain, who intercepted it as it was being galloped off the field. The latter officer, though wounded, divided the traces, and cut down the drivers with his own hand. Shumsoodeen fled to Ghuznee, whither we pursued and vanquished him; and having retaken that celebrated fortress, and witnessed its destruction, we moved on and laid waste with fire and steel the verdant and beautiful vale of Maidaun, reaching Urghaundeh, as before described, in September, 1842. Here it was that, three years before, Dost Mahommed’s guns were found drawn across the valley when the news of the first fall of Ghuznee had induced him to abandon them and fly to Baumiaun. Of the men here depicted, a regiment, called the “Rangers,” was raised in Coistaun, under the command of Lieut. Maule, Artillery, who tried to get it into something like discipline, and certainly succeeded so far as to persuade the wild, unruly, merry fellows to assemble in the most picturesque confusion on a level space misnamed parade-ground. Here they appeared as indifferent to the presence of their commanders as any body of men possibly could be, and equally careless about their facings and goose-step, which they seemed to think, from their uncontrolled laughter, were a pretty bit of fun got up expressly for their own amusement. Some used actually to fire their matchlocks, and shout, when the word of command was given. On the parade being dismissed, they did not go off quietly, but danced, jumped and rushed from their ranks. Surely nothing could surpass the perfect Babel of laughter, shrill cries, and shriller songs that arose, varied with the reports of rifles and pistols, fires at imaginary sparrows, and astonishing other people’s legs. Fighting-quails, bird and fish-nets, were produced by the sportsmen of the party from capacious pockets, while the mimics, for the edification of a crowd of screaming admirers, caricatured, in rude and uncouth postures, the peculiarities of their officers, and the drill they neither understood nor appreciated. In this way they were ready and willing to do service as long as winter lasted; but when it passed away, and “behaur” (spring-time) opened, “at whose kind touch the snows dissolved, and mountains bared their green heads to the sky,” or the harvest and vintage approached, “crowned with the sickle and the wheaten sheaf,” few of these independent gently remained to practice their drill. They were all off to their mountain tops, and on the hue-and-cry being raised, twenty and thirty a day would be brought back bound as deserters from the neighbouring villages. Nor was their hatred to the restraint required by our military discipline to be wondered at, when we remember that they were all trained from the cradle to consider liberty as essential to life as the breath they drew, and taught from children their own wild art of war, the chase, and the exciting pleasures and dangers of manly games and field-sports of every description. 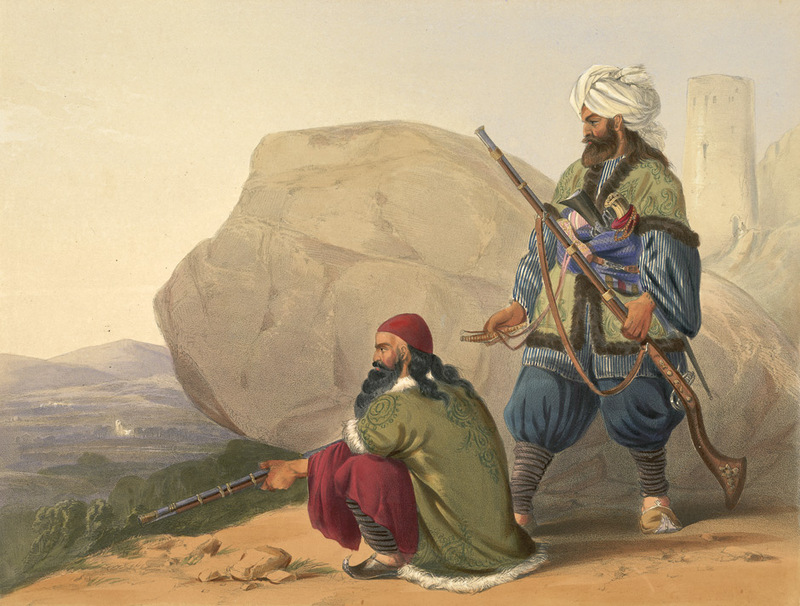 The Afghauns, from the boy-prince to the white-bearded dependant, are all equally devoted to the pleasures of sport, whether of the gun, rod, hawk, the hunt, the wrestling or tilting-match. I remember one tall, gaunt, red-cheeked Irish-looking fellow of the Coistaun Rangers, who cared for nothing but sport at all times and seasons of the year. From day dawn till midnight he was engaged in preparing and setting his snares and nets, or marking down the game for his favorite amusement. In the winter, up to his middle in snow, followed by two or three brace of fleecy Persian greyhounds, and other curs as wild and long-legged as himself, he would be far away in the mountains, tracking the wolves, hares, and foxes, and shooting the Florican, bustard, and “Kubk-e-Durra,” partridge of the valley (a magnificent bird of very game plumage, in bulk nearly the size of a turkey, with a call of the richest tone, like a person practicing the gamut on a flute), or in the valleys running down the red-legged and black partridge, netting quail and grouse, entrapping the wild by decoy fowl, and imitating the calls of every bird that flew. This Afghaun Nimrod heeded not the “assembly;” for the monotonous drill and the restraint of our discipline suited not his roving and independent spirit. “Where rose the mountains, there to him were friends;” so collecting his snares, his hounds, and matchlock, he exchanged the parade-ground for the precipice and towering hilltop. I have often listened with delight to, and remember even now with pleasure, the wild song and flute of my roving friend, who, from the neighbouring heights, when the valley was deep with snow, would break the silence of the clear, cold, starlight nights, with the shrill quavers of his native melody. The song of the Afghauns, when mellowed by distance, or under the circumstances that I have described it, is very sweet, and commences in a low and plaintive key, gradually swelling out and finishing with a shake broken off most abruptly. After my leaving the Coistaun, in September, 1841, Lieutenant Maule and his subaltern, their European sergeants, &c., were on 3rd November all barbarously murdered by the men whom I have been describing. This event took place at Kardurra, twenty miles N.W. of Caubul, where the regiment was then stationed.